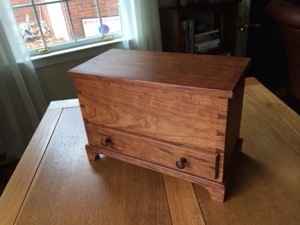 I was at a Society of American Period Furniture Makers meeting in May 2012 and one of the members showed a gorgeous miniature Shaker blanket chest in the form of a jewelry box that he had recently made. I fell in love with it and the concept. I had been reading about blanket chests and seeing them in museums, but we certainly didn’t have room for or need anything that big. The idea of making one in miniature was perfect. I decided to use cherry, since it is both traditional for this type of piece, relatively easy to work and beautiful. 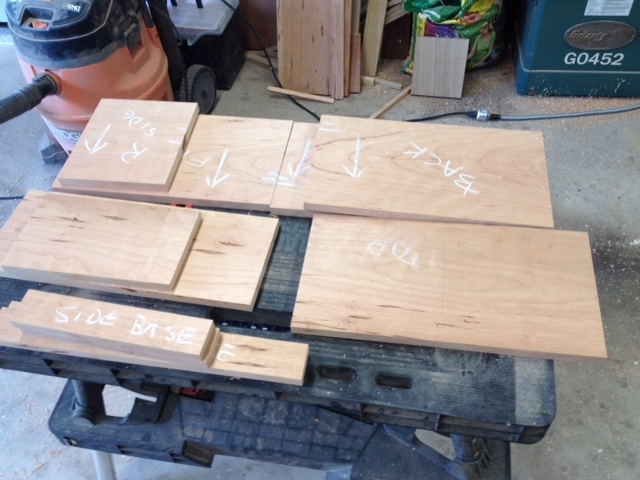 I got a Shaker blanket chest plan and article from Fine Woodworking #172 by Charles Durfee. I scaled it down from 20in deep x 27in high x 40in wide to about 7in deep x 10in high x 14in wide. I found a nice piece of cherry at my hardwood dealer. It had a great grain pattern and some interesting spalting or dark spots. The case is from one piece of cherry so the grain wraps around the piece. I dovetailed the case, putting in a ‘floor’ in the main part of the case above what would be the drawer. For the top, I found a section that had a roughly oval shaped grain pattern that I centered. The drawer is a dovetailed maple box with a cherry front and traditional wooden pulls. The top has small brass hinges from Brusso mortised into the case and top. The bottoms of the racks and the drawer are lined with a brick red wool felt. As a jewelry box, it needed some organized storage. The main case could hold three racks or levels, plus the drawer. I tried to provide different options and some future flexibility. The bottom area of the case has two moveable pieces that hold up the two racks on top, but can be shifted around a bit if needed. The two racks are mitered and glued with a thin plywood bottom, covered by the felt. The internal wooden organizers are glued in and reinforced with small brass pins. 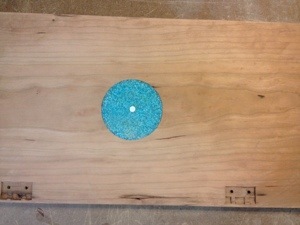 In the midst of making this, I came across a woodworking site where the author talked about inlaying turquoise in wood. I’m becoming a bit addicted to inlay – whether traditional federal stringing or wood banding or brass or silver – but turquoise, who knew! I found some crushed turquoise on the internet, routed out a thin space in the middle of the inside of the top and glued it in with superglue. In the center, I set in a silver dot, an homage to my mom, the original Silver Pearl. I sanded it just like I it was wood and it looks great. Definitely more of that in my future. A most un-Shaker like touch, but somehow jewelry-esque. I finished the interior and racks with multiple coats of shellac and then a couple of coats of dark Briwax wax to protect and soften the look. The outside is finished with multiple coats of Tried and True Original wood finish, an oil and varnish finish that has a natural sheen that allows the grain of the wood to shine through, followed by a couple of coats of wax. I learned a lot building this piece and I think it turned out well. I convinced my ‘baby’ niece Sarah to take it off my hands and, since it’s not too big, I’ll have to prepare to build something larger for her once fiancé Jason learns the fine art of jewelry shopping.